outreach performance skills, then this course is ideal! It suits a group of approx 5-15 participants, and is run as either a 1 day (5hr) or 2 day (10hr) session. People obviously gain more skills if they can participate in 2 days worth of training, but it is realised that this isn’t always possible so there is a 1 day option also! Time is split between helping participants gain experience in using all the Circus Skills equipment (learning to juggle, diabolo, devilstick, speedcups, poi, plate spinning and a multitude of other props), and the other part of the course focusses on understanding how to perform Christian Gospel Juggling and how to write/adapt routines for your target audience. We can work towards the performing of one or more routines that could then be used at a future outreach, or even at the end of the 2 day course, thus giving the participants something practical and effective for use in their future Outreach opportunities! There are plenty of handouts and resources available, you just need to bring yourselves and an open mind to the possibilities of this unique type of Ministry! 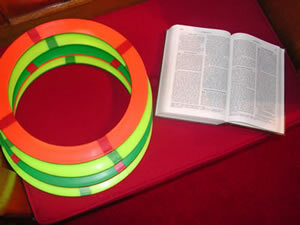 Find out more about Christian Juggling by visiting my Christian Juggling Page. I am available to perform this type of outreach also. Maybe some people will be able to say such things as the following testimonial after your performance?? !